San Diego, California - Art doesn’t just appear out of thin air; but it can come out of clean air! 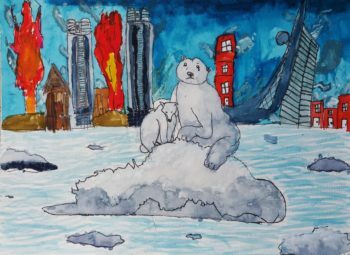 San Diego County’s Air Pollution Control District (APCD) wants to give local students’ artwork illustrating the importance of clean air some free air-time in the district’s official 2019 calendar. APCD is inviting all local students — kindergarteners through 12th graders — to mail in their original artwork to the district, postmarked by Nov. 2, “depicting clean air messages and ways to reduce air pollution.” The art can include words or a message about clean air and pollution, in English or in Spanish. The 13 most creative submissions will become the featured art on APCD’s 2019 calendar that it gives out free every year to the public. All the art submitted to APCD will be showcased on its website. One of the top 13 pieces will be featured on the calendar’s cover; the other 12 top submissions will be featured inside the calendar, one for each month. Students will not only get the chance to see their art published, they will also get the opportunity to make a difference in people’s lives by helping APCD reduce air pollution and protect the public. Art must be the students own work and should be drawn in color, horizontally, on paper 8 ½ by 11 inches in size. Do not fold the art when mailing it. All entries require a completed entry form and must be postmarked by Nov. 2. Judging will be done by a panel of APCD officials shortly after the submission deadline. Everyone will be notified when the results are in. A more complete reading of the rules of the contest are included at the bottom of the entry form. Click on these links to see last year’s winning entries and all of the artwork. So what are you waiting for? On your marks, get set … draw!